The robot has three docks to serve customers and can hold 50 one liter bottles of alcohol or other cocktail components. Inside the machine is hidden a soft drink machine that delivers up to 8 different cooled soft drinks. Can you give us a rundown of how your robot bartender works (photo if you send one) and how it compares to a human bartender? In a way, it works the same way as a human one. It has a robotic arm that mixes drinks and serves those, to be very short. The machine is sized as a small bar - 2,8 meters in a diameter and same height. The robot has three docks to serve customers and can hold 50 one liter bottles of alcohol or other cocktail components. Inside the machine is hidden a soft drink machine that delivers up to 8 different cooled soft drinks. Yanu can also make coffee and has an ice machine built in. There are also many more possible services or goods the machine can sell, but those are planned to come with development further on. How did you ever came to an idea to create a robot bartender? I have been running nightclubs, bars, and restaurants for 15 years. Everyone who has done that business knows what a huge problem is a bottleneck between customers and bartenders. There is never enough bartenders to serve at rush hours and always too many bartenders during the quiet hours. At one point I just wanted to optimize the putout of the bar and thought of automation some processes. The idea evolved and then I came to thinking: But hey why not build a fully automatic, standalone bar that does not need human labor. But if I want to talk to a bartender, then the machine can’t do that, can it? Yes, Yo,u can. We have thought about that. It's funny how everyone asks the same question from me. In reality no-one talks to a bartender in a noisy nightclub or packed festival. Those poor people working there are just like robots who get yelled at, have to deal with drunk people and very tough shifts. That is where we come in with a helping (robot) hand. So yes we have a special AI chatbot that should be quite realistic. 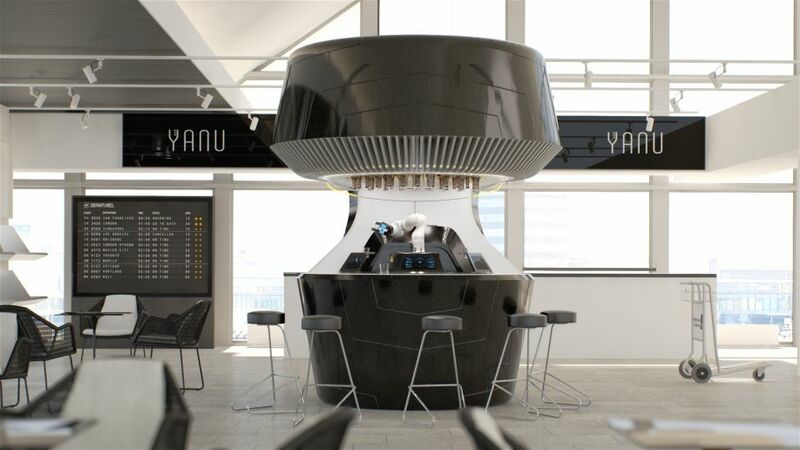 Why is the Yanu better than a human bartender? Anyone who has worked in the service sector knows how difficult it is to find people, how big is the turnover of people, how there is nearly no-one properly educated available, there are problems like stealing, not showing to work, drinking at work, etc. It is an array of problems with a huge paycheck costs. For the years salary of ONE bartender in London or NYC, You can already buy out the whole machine that does the job of 4 bartenders! So this is pure optimization and helping out at the places where there is trouble. Will robots steal our jobs in the end? No, I, don’t think so. We are going through an industrial revolution here, where automation will make our lives much easier and cheaper. And that will create more jobs and possibilities. I advise to google it - many articles from scholars who explain this mechanism of the economy. There will always be nice bars with oldschool bartenders who take time to bow and chat with You. And there will be big nightclubs where the drinks are made by friendly robots: fast, cheap and with a quality. And I am sure this will be a revolution in the service industry. How does the bar function from the bar owners side? The bar needs refilling from time to time, on a heavy use - once or twice a month, in a more quiet venue maybe once a week, It can make around 1300 cocktails and same much soft drinks on one go. Owners have a backend system the monitors the bottles and tanks and reports all errors or maintenace needs. The unit needs electricity, water line and internet. It is easy to install, it is brought over in one piece and ready operate after filling up. The educating and maintenace is done by as. That’s it. Here You go. What about checking the ID of minors? Very simple solution - credit card companies very the age, and we have double checking system with ID verification too. When and where are you planning to roll out the first installations? The machine is ready for Christmas. And the first ten machines for during the next year. And we will have a competition among the places to get it, because the interest is already quite strong.